There are three ways we can help you find information without coming to the Library. Click on the "Ask WA" banner below to open a chat form. 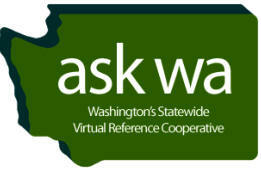 After you submit your question, a reference librarian will be with you shortly. This service is staffed by librarians across the United States. Monday – Thursday; 7 a.m. to 8 p.m.
Friday; 7 a.m. to 4:30 p.m. If school is not in session, hours may vary. If you call when we’re closed, and you leave us your name and phone number, we’ll return your call the next business day. And, of course, you can always come into the library! Your question. Give us as much detail as possible. Background. Is this for a class? What is the assignment?